Photo booths provide a chance for your guests to gather, a chance to laugh, and a chance to start a hearty conversation. Your family and friends take away those priceless moments from behind the curtain, and better yet, the tangible result as well: their photo strip. What better way to preserve them than by offering acrylic photo booth picture frames as a keepsake as well? There are dozens of ways to introduce these photo booth frames amongst your guests. Having the photo booth frames double as a wedding favor to take home, as well as an interaction piece while at the reception is a grand, yet affordable way to add a whole lot of charm to your reception. Here are a few ideas of how to frame your evening! Keep it simple by using the frames to hold your place settings. It is a good way to ensure that every guest has a chance to get a photo booth picture frame. 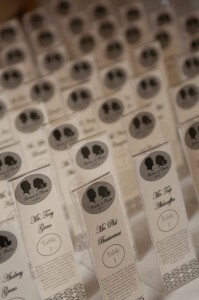 There is plenty of room to include name, table number, and a little something personal from the bride and groom. There are several options from here. Pen a brief, but thoughtful warm wish from the couple to everyone. Choose an all-encompassing quote from a favorite novel or historical figure. You can have the same quote for the entire guest list or choose a different one for each table. It is a good conversation piece for guests among tables. Or, if you are dying to quote you favorite band and your future husband rather quote Family Guy, it’s a good way to compromise! If your guest list is short enough (or if you have enough time! ), a short personal message to each guest would be immensely thoughtful. Now, this is quite a task, but if you can commit, it is a phenomenal way to add a personal touch. 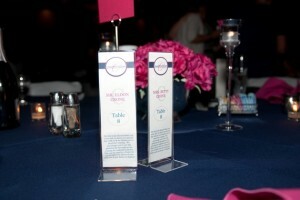 Leave space on the back on the place setting for a spot for well wishes to the Bride and Groom. You can incorporate baskets or small boxes into the centerpieces as means to collect them all. Or, you can keep one large box on the gift table or near the photo booth. Sometimes guests are not very great at wording their sentiments without a prompt. So, add a fun questionnaire on the back of the place setting. Ask questions like, “How do you know the couple?” and “What is your favorite memory with the Bride and Groom?” It gives your guest an opportunity to reminisce about how far you have come as a couple and all the people you have shared your love with on the way. Stick a few golden stickers on the base of just a handful of the photo booth frames. Create a buzz of excitement by informing guests that those with the stars get first dibs on a dance with the bride or groom (after their traditional first dance of course) or get to pick out a song to dedicate to the couple. There are so many “winning prizes” to come up with here, so be creative! Photo booth picture frames are a great way to introduce the concept of using the photo booth, as well as add a whole new element of fun that goes beyond the traditional wedding favor. If you are booking your photo booth through Photo Booth Express give us a call at 877.492.6684 and we can add the photo booth frames right to your package. Great ideas! I will be using these for my own photo booth business.